After the last few weeks of winter games, do you have the Olympic spirit? Are you itching to try a new sport? Maybe you’re thinking about hitting the slopes, trail, or the ice. Now, when you’re motivated, is the time to try something new! But just like in summer, safe and effective physical activity has a few requirements. Whichever activity you choose, you may want to play it safe by opting for a lesson, and always dress in layers to stay warm. Staying hydrated is crucial for regulating body temperature. In the winter you may not feel like you are losing as much moisture. But, you are still losing moisture through sweat and respiration, especially if you are active at higher altitudes (e.g., ski slopes). It’s also imperative to energize your body with proper nutrition! Your body needs carbohydrates, vitamins, and minerals before, during, and after activity to perform at its best and to replenish tissues. Carbohydrates not only pump up your muscles, but the energy they provide fuels circulation, breathing, and temperature regulation. Micronutrients are needed to help the tissues use energy, and some nutrients, like vitamin C, limit muscle soreness and help repair tissues after they have been exhausted. 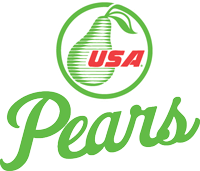 Take a cue from Olympic skier Torin Koos and fuel up with pears! Pears provide the optimal balance of carbohydrates and micronutrients to fuel workouts and replenish tired bodies. Pears are a good source of vitamin C, necessary for proper recovery, and at around 100 calories apiece pears are perfect for a pre or post-workout snack. And if you’re strapping on your skis or board and hitting the powder, pears are portable and perfectly portioned for snacking. So, don’t delay; grab a pear and go for the gold! This entry was posted in Nutrition, Torin Koos and tagged Amy, athlete, Nutrition, pears, Torin Koos by Amy Kweller MS, RD. Bookmark the permalink.